You all know that I love am obsessed with peanut butter. I currently have 4 jars of nut/seed butter at my house and 1 more at my office. Is that excessive? Some might call me a peanut butter snob. Once, I was staying at a hotel that offered a free continental breakfast, and they had those little packages of peanut butter, which I immediately grabbed for my oatmeal. But after checking out the ingredients, and seeing the extra chemicals/oils they added, I promptly put it down. I drove myself to the closest grocery store and picked up a jar of peanut butter with only one ingredient: peanuts. So I probably didn’t need an entire jar of peanut butter for my short trip, but since I was checking bags, I knew I could bring it home (TSA would take it out of my carry-on, I’m sure!) 🙂 Yes, I love the stuff. 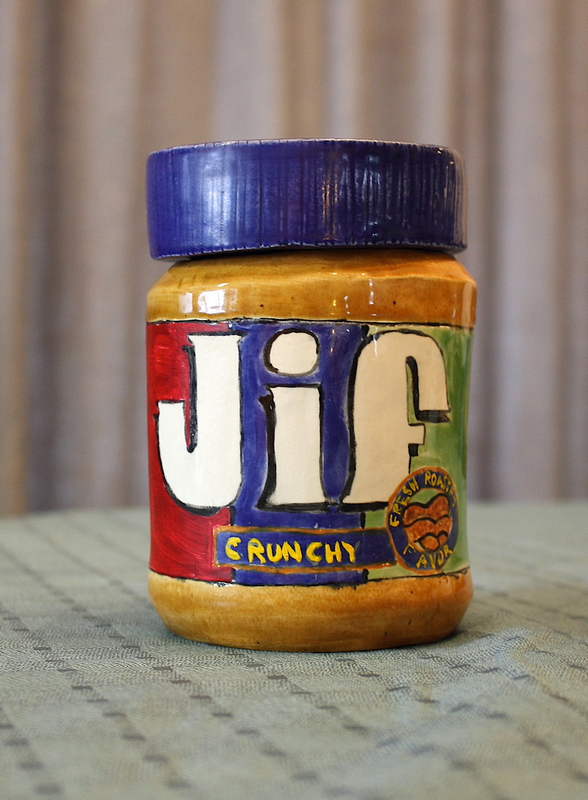 I think I’ve gotten a little “choosier” about my peanut butter since then, but apparently I liked the stuff enough to recreate a jar of it for my pop art project. 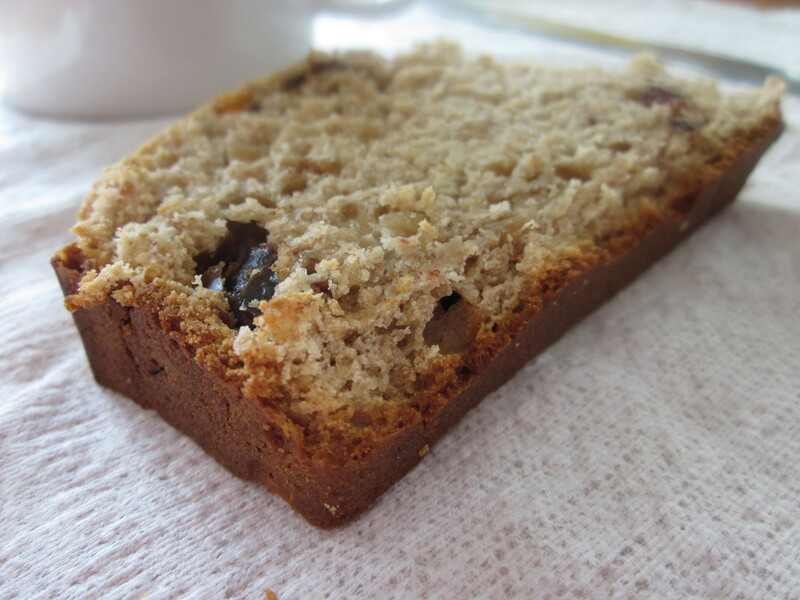 Annnyhow, when I saw Jenna’s recipe for Peanut Butter Sandwich Bread, I starred it in my Google Reader and couldn’t wait to find the time to make it! Well friends, I found the time, and Oh. my. goodness! I wasn’t exactly sure what a “Sandwich Bread” would be like, because I’m used to quickbreads that are moist, like banana bread and zucchini bread. This was a little drier than those breads, but still moist enough that I didn’t need to put anything on top of it to make it easier to swallow. I LOVED the texture of the bread, and the combination of cinnamon and PB is just incredible! 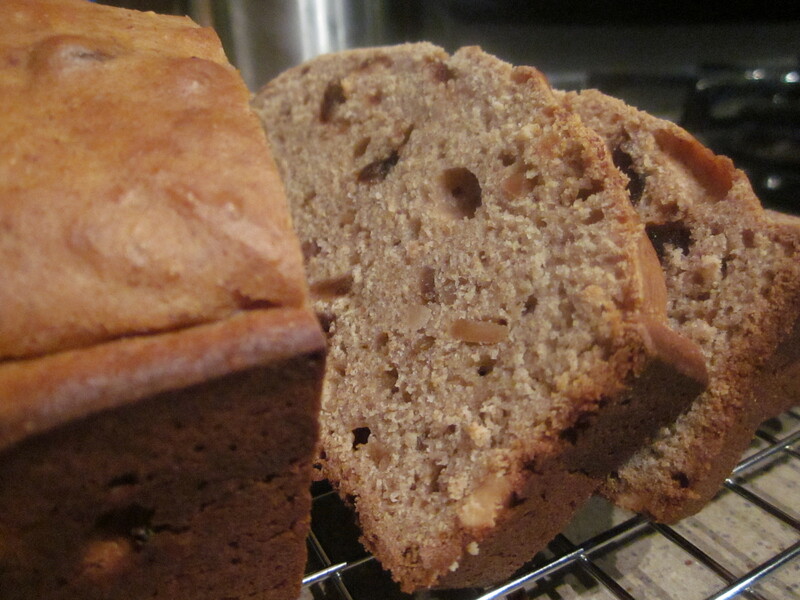 I perked up the recipe just a bit by adding some dates for a little extra sweetness. The bread fueled me through my morning swim practice, and also makes a great post-workout snack too:-) Or, you can just eat it any ol’ time. It’s THAT good. If you like peanut butter a fraction of how much I love it, you will enjoy this bread! Preheat oven to 350 degrees and grease a loaf pan well. Cream together the peanut butter and sugar until well combined. In a separate bowl, combine the flour, baking powder, salt and cinnamon. Set aside. With the mixer running on low, slowly alternate between adding the milk and the dry ingredients. Mix until smooth. Pour batter into greased loaf pan and bake for one hour. Let cool in pan for 10 minutes before turning out on a wire rack and cooling completely. 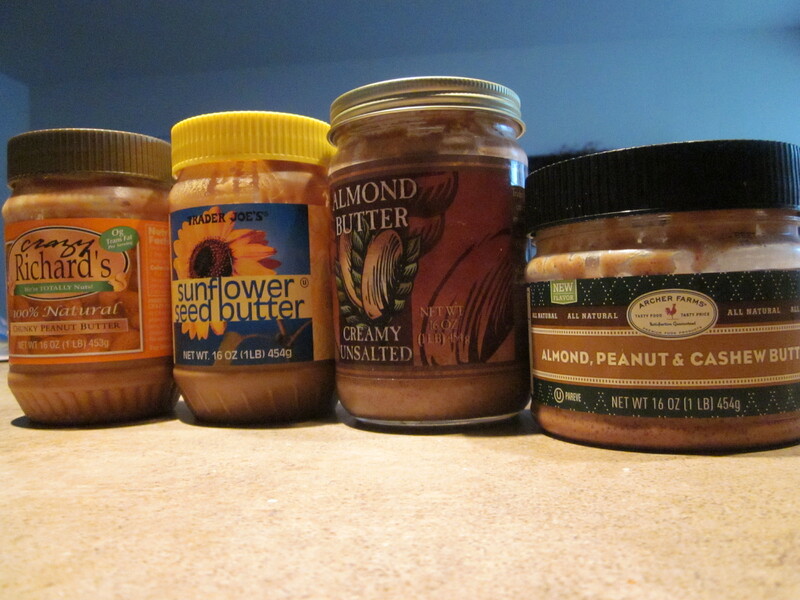 Question of the day: What is your favorite kind of nut/seed butter? What is your favorite way to use it? I LOVE the freshly ground stuff from WF! I really want to try experimenting with making it myself! YUM! Looks delicious. Who isn’t obsessed with nut butters once they’ve tasted them? I have a slow couple weeks at home ahead and am definitely trying this recipe. Any suggestions for something to top the bread. I’m sure it is good on its own, but just in case I feel the need to dress it up? I think a little honey butter would be just enough! Or, toast it with some jam! If you are feeling daring, maybe even some nutella! One more thought- Marshmallow Fluff!! !